Williams has re-written several other classic tales in colourful, comic-book style. 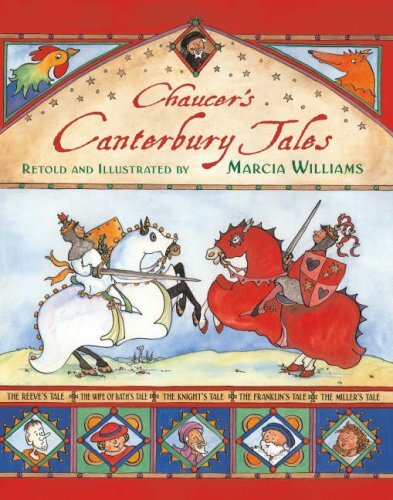 The Canterbury Tales , in which pilgrims try to outdo one another in storytelling, as they travel from London, is not obvious reading material for children and the publisher’s intended audience of ‘Ages 5+’ is well wide of the mark. It is more suited to age 9+ in terms of the content, ribald humour and bawdy topics. There is essential toning down in the content, though no holding back on the thunderous ‘in your face’ farts, (literally) illustrated in graphic watercolour and ink detail, which will no doubt entertain. Williams is true to the essence of the original tales as much as possible. The most popular tales, including ‘The Pardoner’s Tale’, ‘The Wife of Bath’s Tale’ and ‘The Nun’s Priest’s Tale’ are here, along with the more risqué and earthy reeve’s, miller’s and summoner’s tales. Some of the original dialogue is included within the picture frames but the accompanying narrative text, in modern prose, and the busy illustrations of interestingly varied sizes, make clear the story in language and pictures.